I’m back on my mushroom kick again. It’s not the first time, and I assure you it won’t be the last. I just love them, as I’m sure you remember from my Chicken Marsala Pasta post. Of all things mushroom, this soup has to be my favorite. Throughout my childhood and into my teenage years, I requested it often from my dad and grandma. Obviously, I had to start making it for myself, and since there was never really a recipe, I came up with my own. 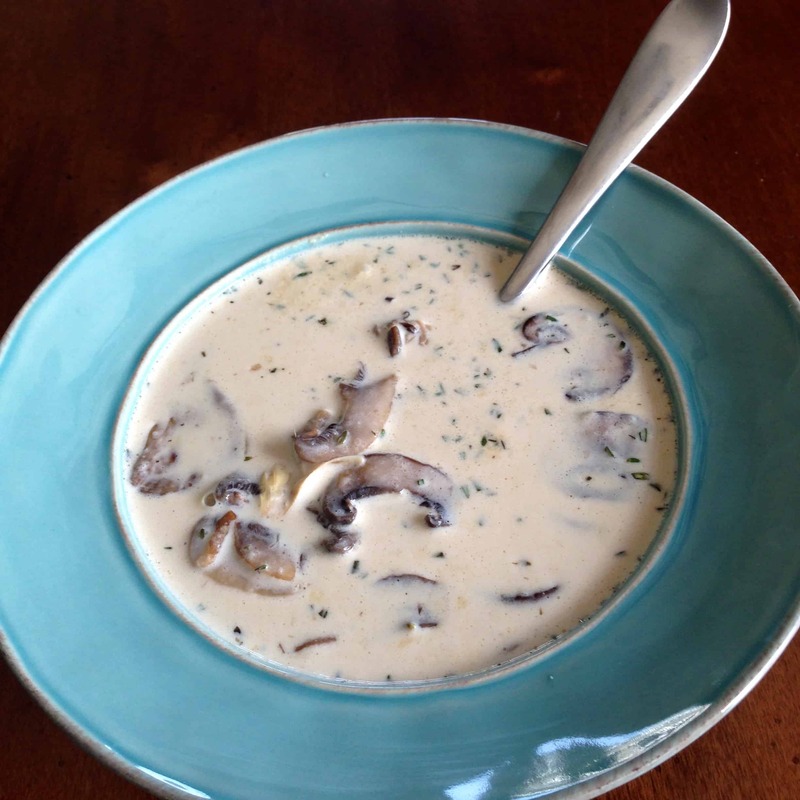 Read on for my mushroom packed recipe for Homemade Cream of Mushroom Soup. 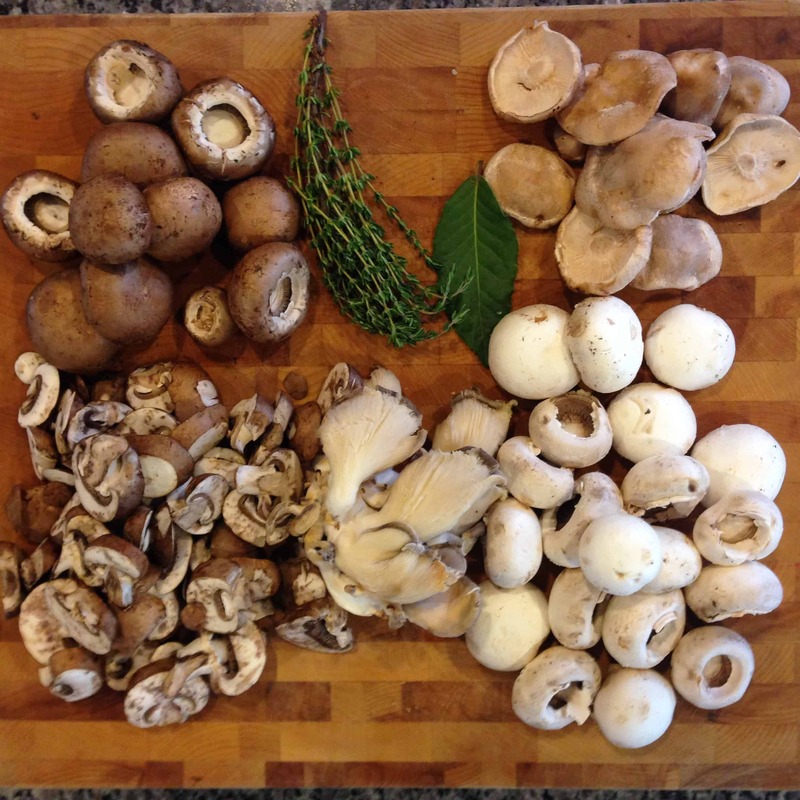 I get maybe a little too excited when I see the varieties of mushrooms that are available at most grocery stores (food nerd alert! ), and this soup can be made with any combination of them. Whatever you choose will be perfect, so get creative. It is rich, creamy, and comforting, but not overly thick as some “cream of” soups can be. Also, some mushroom soup recipes are ridiculously skimpy with their mushroom proportions, and the end result is really disappointing. So, while my amount might seem excessive, I promise it’s worth it. This is serious mushroom soup; I’m not messin’ around. I still love topping it with my childhood favorite of crumbled saltines or oyster crackers. For something more substantial and dinner time appropriate, I like to serve it with grilled cheeses (for dunking of course!) made with either Fontina or Gruyère cheese (these two cheeses pair really nicely with mushrooms and thyme). No matter what you serve it with, you’ll be happy. It’s the perfect meal on a chilly fall day or night, kind of like a big hug for your tummy. Yum, yum, yum…. Heat 1 tablespoon butter in a saucepan and add mushroom stems. Cook for a few minutes until stems begin to brown. Add stock, 1 cup of water, and 4 sprigs of thyme. 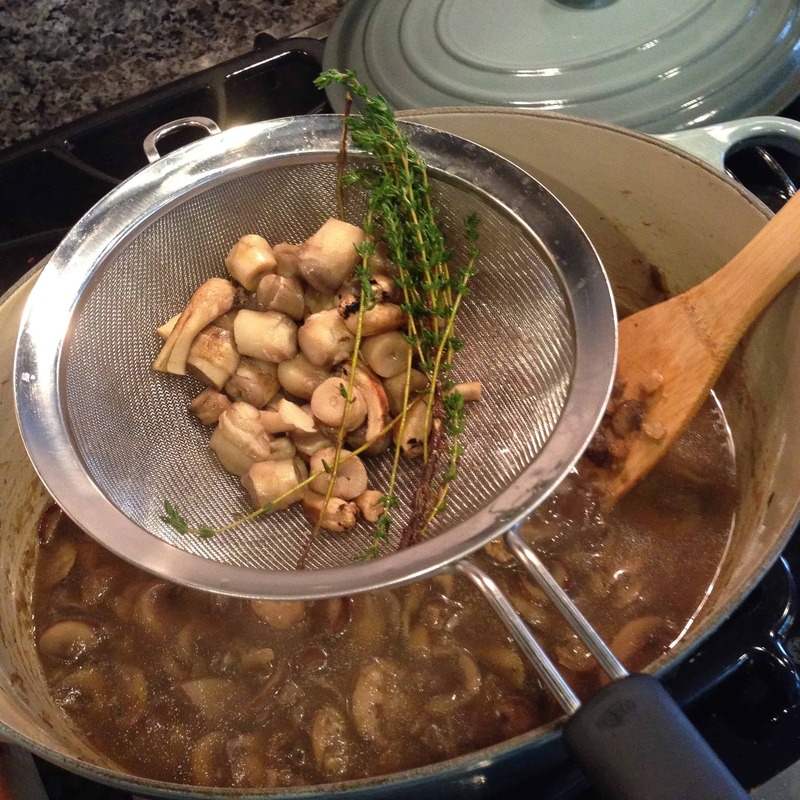 Bring to a boil and let simmer while you prepare the mushrooms. In a large pot or dutch oven, melt 2 tablespoons butter and add onion and a good pinch of kosher salt. Cook over medium heat until onion softens and begins to brown. 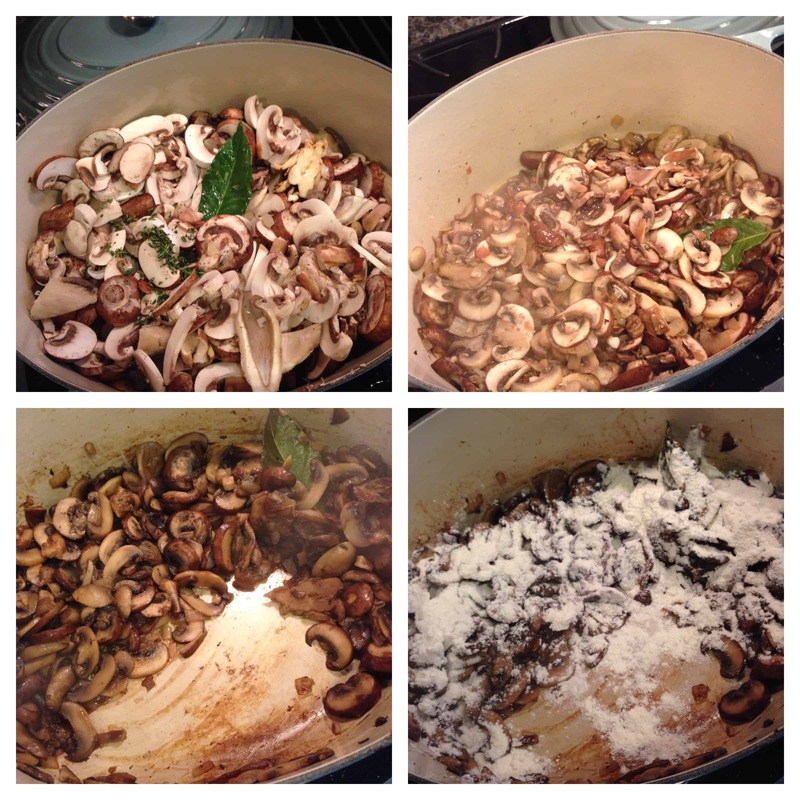 Add sliced mushrooms, garlic, chopped thyme, bay leaf, salt and pepper. (At this point you might think I’m crazy, but just trust me! The mushrooms cook down quite a lot during the next few steps.) Stir, and cover with a tightly fitting lid for 5 minutes. After 5 minutes, stir again, replace lid and cook for another 5 minutes. At this point your mushrooms will be very soft and have quite a bit of liquid. Remove the lid and continue cooking over medium-high heat, stirring occasionally, until liquid has evaporated, about 10 minutes. Add wine and cook, again, until most of the liquid has evaporated. Add the final tablespoon of butter, once melted add flour and stir for a minute or so until you can’t see the white of the flour anymore and the mushroom mixture becomes thick and pasty. Strain the mushroom/chicken stock directly into the soup pot containing the mushrooms, and cook for 15 minutes over medium-low heat, stirring and scraping the bottom occasionally. After 15 minutes you will have a thick, almost gravy-like consistency. Add cream and half and half. Stir to combine and heat through, but make sure not to boil. Taste for salt and pepper, adjusting as needed. Serve in big bowls with crackers, bread, or grilled cheese on the side. It’s warming me up just looking at it.